A membership system can help you serve your members(customers) more effectively and also helps you increase member satisfaction and improve sales. It is important for businesses to create and operate a in-house membership system. Not only for a loyalty program for providing discounts for members but also makes you maintain contact with them more effectively. 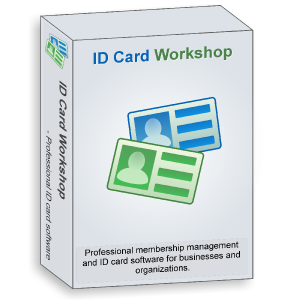 ID Card Workshop – a software combined with membership management and id card creating features, which helps you to create your own in-house membership management and membership cards issuing system with few clicks. In-house membership system means storing data locally, and operating the system by yourself. It it important, since member data is an important asset for the business, you shouldn’t outsourcing to the third-party to operate the membership system and issue membership card for you. And also shouldn’t share your member data with these third-party company. Now with the helps of ID Card Workshop, you can operate an in-house membership system and membership card system at low cost! You can use either professional id card printers or consumer-grade inkjet/laser printers to print your membership cards. and pay for the software month-by-month or purchase the full version at once. The new version of ID Card Workshop has built-in two major features to enable you to build your own card issuing and card verification system with barcode embedded cards and barcode scanner. The first feature is the ability to create QR code and 1D barcode cards. the designing feature enables users to insert QR codes and 1D barcodes into the canvas and arrange them as they like. and each QR code and 1D barcode element support data merge feature(as known as ‘variable data printing’) which allows users to merge data fields from excel, mdb or sql based databases with a pre-defined designs to output variable text and image. The second feature is records seeker, this feature enables users search records by scanning barcodes or directly entering the id number or name etc. when ID Card Workshop found the records matched with your input, it will display all the detailed information on to the screen, you can verify whether the record matches with the card.